Running shoes are big business and for runners there is often a degree of anguish pre-race as they try to choose the appropriate footwear for the race – do I go for light weight or for cushioning in a marathon? Do I wear spikes, if so what length, or football boots or studs for the National? and so on. At one time there were heel tabs designed to dig into the Achilles tendon on all shoes and coaches instructed runners to cut them off or to make a slit and pull the offending foam rubber out. One runner that I knew bought New Balance training shoes for a number of years but always tore the insole out before running in them! Graeme Orr has been running for decades and has some definite thoughts on running footwear and these are reproduced below. His thoughts certainly struck a chord with me and my experiences – they probably will for you too. Track, field, road and cross-country footwear has undergone a revolution through the course of the 20th century. Although I can vouch first-hand for only the last 50 years or so, I’ve seen many changes, not all for the better. I guess the history of runners’ footwear dovetails neatly with that of the modern Olympics, in particular the showpiece marathon. There was surely a Faustian pact between shoe-makers and runners: the former would offer the magic winged footwear that would carry the wearer to inevitable glory. However, two great heroes of the marathon bucked the deal, each with his particular version of metatarsal torture. First, in the 1904 Olympic Games in St. Louis, a Cuban postman, Andarin Carvajal, turned up 5 minutes before the marathon race start, clad in singlet, truncated trousers and boots. He was well-prepared in terms of fitness, however, and would have bettered his fourth place if his pre-race diet and choice of footwear had been better planned. Some 3 decades later, in the notorious 1936 Berlin Olympics, it’s worth noting that the great Jesse Owens had help from Adolf in his victories! I refer to Adolf (Adi) Dassler, later to found the Adidas brand, who persuaded Owens to try out his firm’s latest spikes. Adidas had a link to the exploits of the legendary Abebe Bikila in the 1960 Rome Olympics, where the story goes that the Ethiopian found the shoes provided by the sponsoring shoe company were uncomfortable. He chose to run barefoot, as he had done in training – the rest is history. Bikila repeated his success in Tokyo in 1964, shoe-clad on that occasion, and might have completed a third victory in Mexico City, but for a near-fatal car accident in the lead-up to the 1968 Games. So what were the choices for budding British athletes back in the 60s? Some of us started out in such mundane, football- or tennis-oriented brands as Gola or Dunlop. 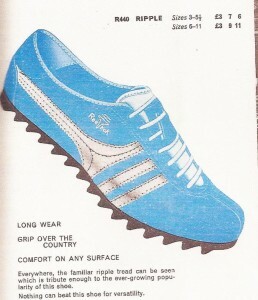 Adidas had a near-monopoly in the spikes market, Puma (run by Adolf Dassler’s brother) being the only major option. Such was their hold on the market that the IAAF proposed in 1970 that future Olympics would adhere to the amateur spirit of the Games by banning any distinguishing stripes on track footwear; only plain white shoes would be permissible. This went down like a lead balloon with the Black Power crew, and was never implemented. However, the Adidas-Puma duopoly was under threat from several new sassy kids on the block. Japan used the Tokyo Games to raise the profile of their Onitsuka brand. Many road runners resorted to the light, cheap, but comfortable canvas “Tiger Cub” trainers, which cost a mere ten bob, and came in a polythene carrier-bag with draw-strings: practical! More exciting still were the new road, track, and cross-country shoes produced in Bury by Reebok. Highly affordable at £3 to £5 a pair, the 1960s shoes still had leather uppers, but the top of the range track shoes used kangaroo hide. Boing! In the 70s, Reebok were lured to the States, to compete with Nike, the new brand developed by the late Steve Prefontaine’s trainer before the 1972 Munich Olympics and its unforgettable 5000 metres men’s final. No shoe design company is infallible, however, and this prompts me to “out” three of the greatest “turkey” trainer shoes ever devised. Take a bow, Reebok Ripple (above) – designed to challenge any haggis running round a hill on its unequal legs. 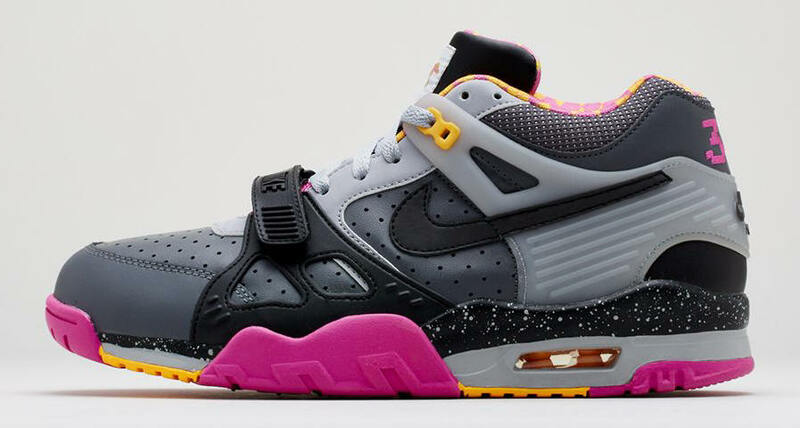 The corrugated sole had zero lateral grip on wet, muddy ground, and must have led to a few nasty falls – but at least it was cheap: unlike Turkey no.2, the Nike Air. OK, a training shoe, but a disaster for any (that’s most) runners whose feet pronate (ie land unevenly) on road and trail surfaces. Air, to my knowledge, has no shear strength (to venture into engineering terms), so that little air-blister under your heel only exacerbates pronation, causing possible foot injury to add to the damage to the buyer’s wallet. Mind you, there’s another turkey to come (the barefoot cop-out foot-glove option), but first let’s salute a lo-tech shoemaker and runner. Billy Minto is (as I write) an engineer on the new Forth Bridge crossing, but is also a Hunter’s Bog Trotter. I was the lucky winner of a pair of his homemade trainers: woven nylon stapled to footprint shapes cut from car tyre treads, if I recall right. Alas, but they were too dainty for my big feet! Let’s return to the natural alternative to running shoes: barefoot running. Bikila’s shoeless marathon victory captured the public’s imagination back in the 60s. Two prominent followers of his example are worth mentioning: Bruce Tulloh, an English middle-distance runner who often raced barefoot, and Fergus Murray, who notably won the 1966 Scottish Senior Cross-Country Championships at Hamilton race-course in 1967, similarly unshod. 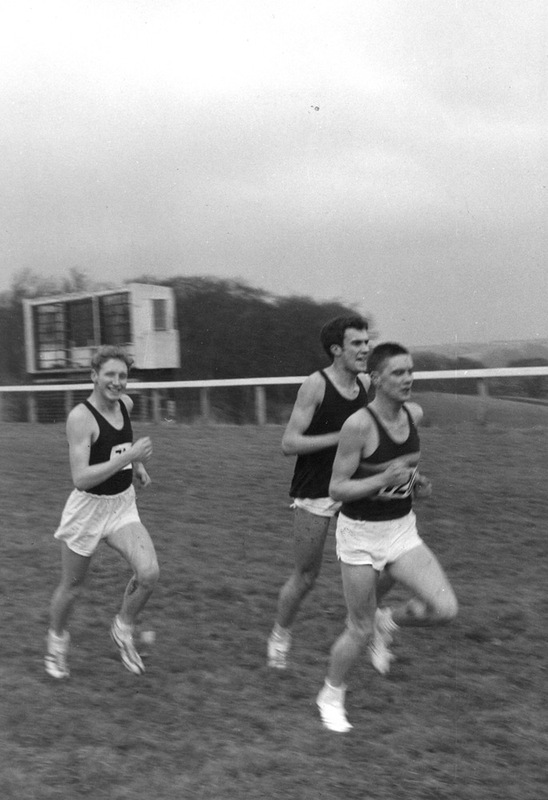 Modesty, alas, doesn’t prevent me from adding my name to that august trio: my first competitive race was a junior mile, part of a match between my school and a posh school in Perthshire, who had a grass track. I set off barefoot, and triumphed. The most recent prominent barefoot track runner was the young South African Zola Budd, who was hastily co-opted to the UK Olympic team in 1996, where she inadvertently sabotaged both her own chances and Mary Decker’s (the US favourite) in the women’s 5000 metres heats. Mud, glorious mud – sometimes mixed with doggy-doo. Sharp objects, from the Point-ed Stick of the Python sketch to broken glass or discarded “gear”. Lack of traction or safe footholds on certain terrains, such as ice-sheets. All of the above can imply the risk of cuts and abrasions leading to possible infection. 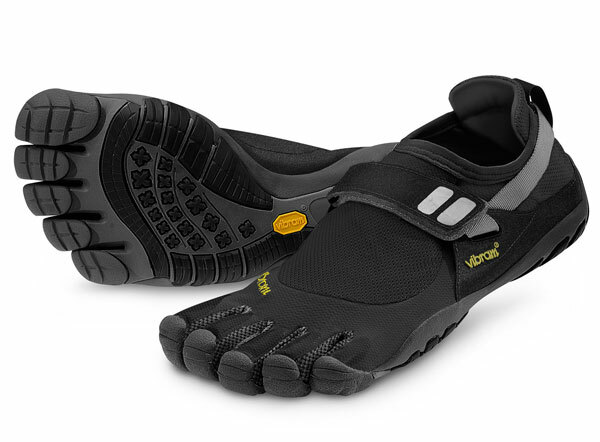 The Vibram FiveFingers range of rubbery foot gloves (below). I remember finding a runners’on-line blog where runners were discussing these. One female described the feeling as that of wearing kitchen gloves for too long: not only do the feet get hot and sweaty, yiour foot begins to slither within its rubbery encasement, negating any benefits of natural foot-to-ground contact. I’d say that Vibram have a tougher sell than condom merchants – at least the latter are cheap and disposable! The Fivefingers range doesn’t offer you much change out of £100 at present. first, Danny Orr (no relation? ), running product manager at New Balance shoes, writing in that “fashionista” style bible, the “Short List” free sheet, notes that the difference in one’s posture and mid-foot landing position barefoot lead to reduced risk of injury. This is borne out by a 2010 article in the “Telegraph” newspaper by Chris McDougall, which also states that expensive trainers offer no guarantee against injury, and in fact can make runners more injury-prone. Which takes me to my other bugbear – the price of running shoes. While one is obliged to fork out upwards of £60 for specialist hill or track race shoes, there is no need to pay much over £10 for decent and durable trainers. There used to be a chain of outdoor-wear stores (Famous Army Stores) who did a grand pair of sturdy road shoes for £7; ALDI recently offered trainers for double that sum. If you just must have those ultra-light shoes that everyone’s wearing, check for on-line sales.